What Is Laser Therapy For Dogs And How Does It Work? At Prestige Animal Hospital, we pride ourselves with always searching for new ways to care for your dog especially where pain is concerned. Veterinary laser therapy provides a non-invasive, pain-free, surgery-free and drug-free treatment that is used to treat a variety of conditions, and can be performed in conjunction with existing treatments. Laser treatment for dogs employs deep-penetrating light to promote a chain of chemical reactions known as photobiostimulation. This process helps relieve pain through the release of endorphins, and it stimulates injured cells to heal at an accelerated pace. Although improvement is often seen after the first visit, your dog's condition will influence how often and long laser therapy is necessary. Treatments vary in length, but most sites require 3 to 8 minutes. Laser treatments for dogs are cumulative, so each additional treatment facilitates a greater improvement in your dog's condition. The length and frequency of treatments vary by condition, so allow your veterinarian to help devise a sufficient laser treatment schedule for your canine companion. Laser therapy, also may be referred to as Cold Laser, Low-Level Laser or Class IV Laser Therapy. Each of these terms refers to the same therapy, using the same equipment to stimulates cell regeneration and increase blood circulation. What Types Of Conditions Can Dog Laser Therapy Be Used To Treat? Laser treatments are an excellent way to provide pain relief to your canine companion. Laser therapy reduces pain by reducing inflammation through "vasodilation" (the opening of blood vessels) and also by activating the lymphatic drainage system, thus draining swollen areas. The result is a reduction in swelling which reduces pain. The lasers also stimulate nerve cells that block pain signals from being transmitted to the brain, thereby decreasing nerve sensitivity. Because there is less inflammation, less swelling and an interruption of pain signals to the brain, the dog will experience less pain. Laser treatments for dogs also stimulate the production of high levels of naturally-produced endorphins which further counteract your dog's pain. Dog laser therapy is a very helpful tool during postoperative recovery. In minor cases, laser therapy alone may be enough to alleviate pain and stimulate the healing process. Because it works directly on injured or affected areas, laser treatments can help speed up healing, strengthen muscle and tissue, improve mobility and enhance your dog's overall quality of life almost immediately. What Can I Expect At My Dog's Laser Therapy Appointment? A technician will hold the laser wand directly over the affected area for somewhere between 3 and 10 minutes. There is no pain associated with the treatment and most dogs will relax during this time. The almost immediate relief of pain will allow your dog to be comfortable and any anxiety he or she initially experiences will quickly dissipate. Occasionally, some dogs actually fall asleep during their therapy sessions. Is Laser Treatment For Dogs Painful Or Uncomfortable? Laser treatment for dogs is totally pain free and very comforting. 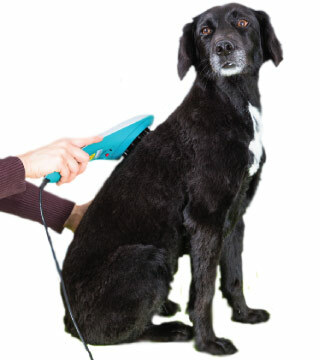 As the laser is administered, your dog may feel a gentle and soothing warmth, tingling, or no sensation at all. For many canines, dog laser therapy is very relaxing. As areas of pain or inflammation become more comfortable, any anxiety and tension your dog may be experiencing tends to quickly dissipate. Are There Any Side Effects Of Laser Therapy For Dogs? Laser treatment for dogs has no known side effects, and is considered both safe and effective across the veterinary industry. How Can I Schedule A Dog Laser Therapy Appointment? Scheduling an appointment for veterinary laser therapy is as easy as picking up the telephone, sending us an inquiry through our contact page or visiting our veterinary hospital in person. Our knowledgeable, compassionate veterinary team can help answer any questions you have. Make an appointment for your canine companion to begin experiencing the benefits of laser therapy today!